Dar Si Hmad for Development, Education and Culture: Introducing the Environmental Youth Ambassadors!! We've been hinting at our new program in the past few blog posts. Today, we're happy to formally announce the Environmental Youth Ambassadors! Our EYAs are seven RISE participants who have taken on an opportunity to work with Dar Si Hmad on environmental education and media. 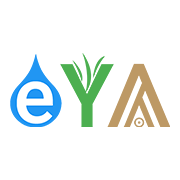 The EYAs joined our Water School to help teach young children in the ecologically fragile communities of Aït Baamrane the importance of conservation, resource management, and environmental protection. Following their experiences in the bled, the Environmental Youth Ambassadors are running a series of events in and around Agadir to engage their communities in environmental action. In their own words, "Environmental Youth Ambassadors (EYA) is an environmental education and advocacy program established by Dar Si Hmd (DSH). 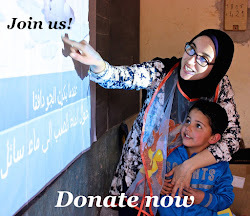 The aim of this project is to allow young Moroccans to use visual storytelling and environmental journalism to advocate for environmental issues in southwest Morocco on a local and international scale, which do not receive significant attention or publicity. 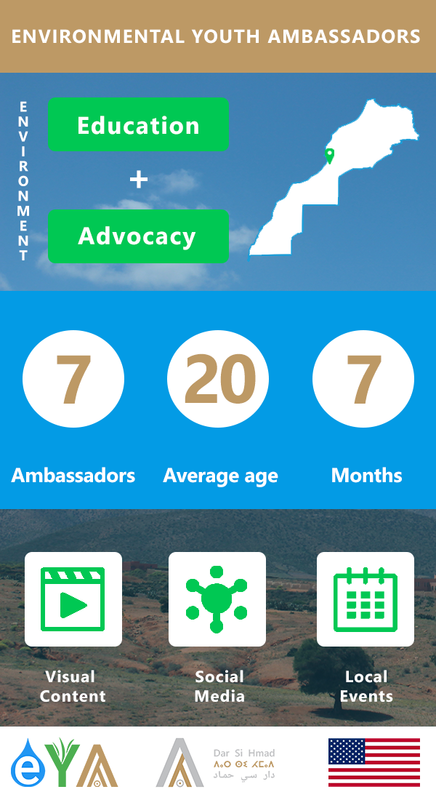 Particularly as the COP22 conference to be held in Marrakech in November 2016 approaches, this kind of conscientious, locally-driven initiative will be a powerful contribution to the dialogues and pledges surrounding COP22, showcasing the vibrant efforts of youth from all corners of Morocco who are raising awareness about and combating climate change." Abdelhaq is a twenty-years old undergraduate student majoring in Management at Ibn Zohr University with interests in information technology. His environmental experience began in childhood while volunteering in beach clean-ups activities and was selected to represent his high school in a regional meeting organised by Surfrider Foundation discussing environmental issues such as pollution and animals extinction. Abdelhaq speaks Arabic, French & English. Oumhani is a twenty-one years old, third-year student majoring in Environment, Energy, and Process Engineering at Ecole Nationale des Sciences Appliqués (ENSA) in Agadir. Passionate about environment and sustainability, she is an active member of Process Club where she worked on many projects and event related to the field. Oumhani speaks Arabic, English and French. Salma was born in Safi but merrily lived her 20 years in 7 different regions all over Morocco, having the chance to appreciate the cultural, linguistic and natural diversity of the country. Salma is a nature enthusiast and always eager to invite the community to preserve the gifts of mother Nature through simple but impactful actions. She is passionate about languages and taught herself Korean, Spanish and German, and currently pursuing her studies at Ecole Nationale de Commerce et de Gestion (ENCG) in Agadir. Rkia was born in a town named Addar – Sidi M’Bark in Sidi Ifni. She graduated from Ibn Zohr University with a Bachelor’s degree in English Studies (Linguistics) in 2015. Rkia loves learning different languages and cultures as she speaks Tachelhit, Arabic, French and English and currently learning Italian and Spanish. She is fascinated by environment protection as “Our Mother Earth keeps serving us and it’s time to be keen, contribute, participate and make a positive change in our community”. Mohamed is a twenty-one-year-old Agadir native pursuing a Bachelor’s degree in Economics & Management at Ibn Zohr University. He is an alumnus Dar Si Hmad’s U.S.-MEPI RISE program and a member of RISE’s Journalism Club. Mohamed is passionate about environment, social work and art. He love playing chess, reading about scientific and philosophical subjects, photography, traveling and recently started playing Capoeira. 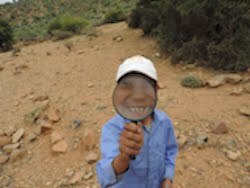 Mohamed is a twenty-years-old student from Tinghir, High Atlas Mountains-Morocco. he is majoring in English Linguistics at Ibn Zohr University. He has had a passion for the environment and an interest in voluntary activities from a young age. This has led him to explore and volunteer in many environmental and social activities interacting mainly with little children; Mohamed believes in sustainable education and empowerment of the next generation, which is very essential in helping to build a sustainable future for all. Born and raised in a small village near Ouled Teima region, Mahdi was the first one of his family to graduate from high school and go to college. Passionate about social activism and nonprofits, he led a registered local NGO is his home village and was an active member of several youth-led initiatives in Morocco. Mahdi was a 2015 U.S.-Middle East Partnership Initiative (MEPI) Student Leader at Benedictine University (USA), and currently studying at Ecole Nationale de Commerce et de Gestion (ENCG) in Agadir. The Moroccan Arabic word for yes is "eya". Our Environmental Youth Ambassadors say "yes" to environmental action in Morocco and around the world. We invite you to join them in their adventures leading up to COP22. Check them out on Facebook, Twitter, and Instagram. And be sure to follow their blog for environmental news, opionions, poetry, and more: https://eyadarsihmad.wordpress.com/blog/.